Dark Horse Comics have just announced that this October, the entire first chapter of the Eisner Award-winning Black Hammer is going to be released in a deluxe, oversized hardcover collection. This new edition of the critically acclaimed series from Jeff Lemire and Dean Ormston features a beautiful cover by Ormston with colors by Dave Stewart and collects Black Hammer #1-13, the Giant-Sized Annual, sketchbook extras, and more! The tome features art by Ormston, David Rubín (Ether), Dustin Nguyen (Descender), Emi Lenox (Plutona), Nate Powell (March), Matt Kindt (Mind MGMT), Ray Fawkes (One Soul), and Michael Allred (Madman). 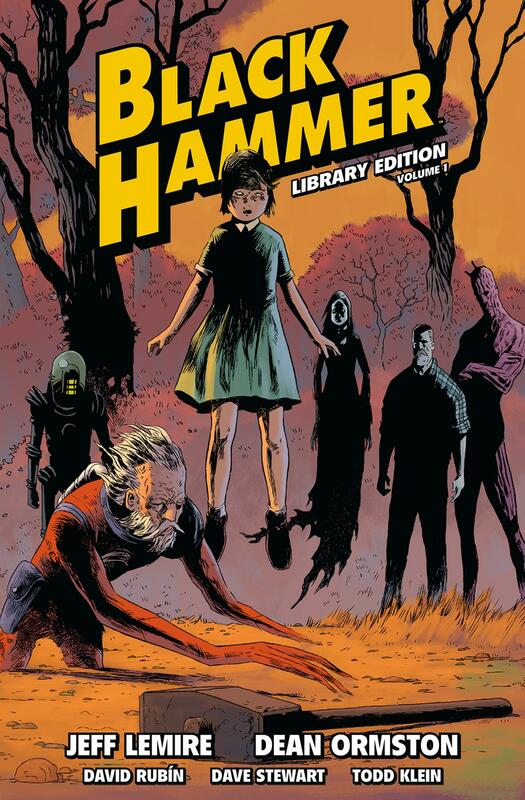 Black Hammer Library Edition Volume 1 goes on sale October 24, 2018. This new edition is 408-pages and retails for $49.99.